May is my favorite month. It's still generally a little bit cool and the Farmer's Markets begin to open! A trip to our local Wednesday night Farmer's Market was the perfect way to get ready for the second round of the Healthy Lunch Challenge put on by Crunch A Color! 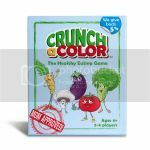 The Crunch a Color cards are a fun game your kids can play! You earn points for the different foods you eat and even a 2x bonus if you try a new food! Pit siblings against each other and even mom and dad can join in! In the end, every wins because they are getting excited about eating nutritious foods! 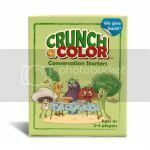 There is also a set of Conversation Starters which are fun to play at dinner time! This first lunch is very simple to put together because everything is straight from the market! 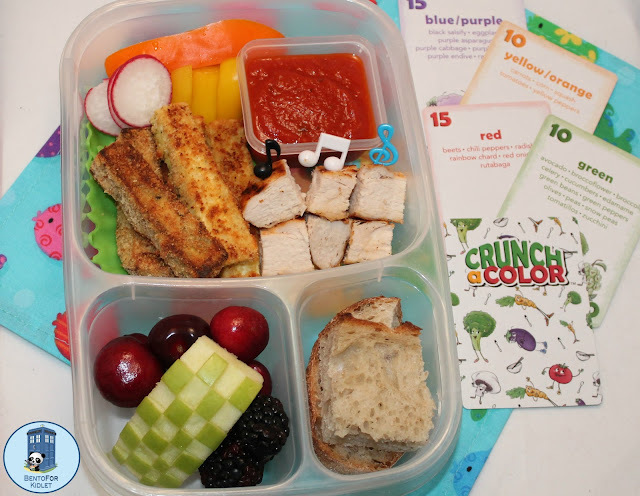 This lunch is worth 110 points in the Crunch a Color game! Main Compartment: Garlic Cheese Curds, Ham, Rosemary and Olive Oil Bread made with whole wheat and rice flours, and cherries! This lunch is just as fantastic but takes a little bit more work! Recipe for the Eggplant and Zucchini is below! 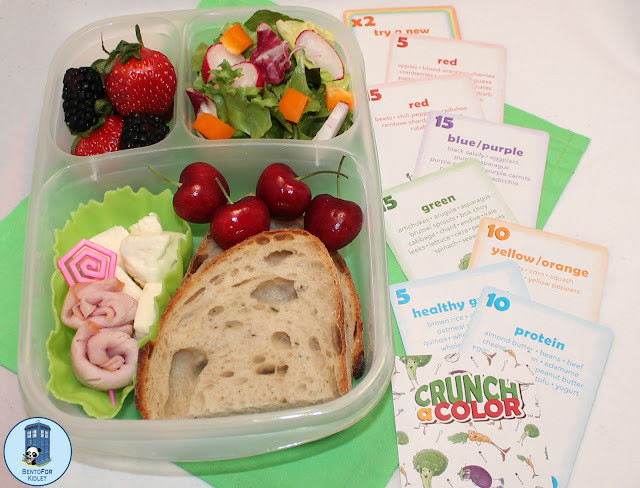 This tasty lunch would earn you 90 points in the Crunch A Color game! Main Compartment: Eggplant and Zucchini Sticks, Grilled Chicken Skewers, Tomato Sauce for dipping, Radish, Orange and Yellow Bell Peppers. Eggplant and Zucchini sticks are one of Kidlet's favorite things! They are crispy and delicious! Mix the bread crumbs, cheese, and seasonings in a bowl. Two easy and tasty lunches with delicious Farmer's Market finds! Kidlet was very happy to munch on these! Both of these are beautiful and fantastic! I love May, too, thought it's been unseasonably hot here already. Feels like summer. The ham rolls in the first lunch are adorable! And while I'm not a fan of eggplant, I can't wait to try the sticks! Beautiful lunches! Everything looks so delicious! Those eggplant/zucchini sticks look delicious!